Conservative MP and Mayor of London Boris Johnson sarcastically compared his new cabinet post in Westminster to a zero-hours contract, insisting the lucrative promotion will not detract from his mayoral duties. 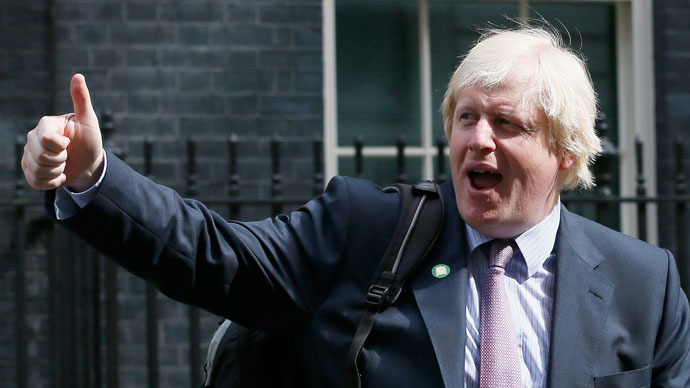 Johnson is the first Mayor of London to serve in the cabinet simultaneously. Speaking on Tuesday as Prime Minister David Cameron announced his new cabinet, Johnson said he will have no trouble juggling his role as MP for Uxbridge and South Ruislip with his mayoral duties. In addition to his elected roles, he also writes as a newspaper columnist. Zero-hours contracts are perceived by economists as a symptom of a broken system that prioritizes profit over the welfare of workers. Johnson’s remark has attracted widespread criticism online, with social media users denouncing his comment as inappropriate. Probed on his appointment to Cameron’s all-blue cabinet, Johnson said he had accepted a role that ex-Labour leader Ed Miliband had attempted to outlaw. “It is a zero-hours contract. It is definitely not a job. I have accepted a role that Miliband wanted to ban,” he said. In April, ex-Labour leader Ed Miliband pledged to scrap zero-hours contracts on the grounds they are “exploitative” and offer employees no security. Speaking at an event in Huddersfield, Miliband argued zero-hours contracts serve the interests of employees while staff suffer. “You shouldn’t be left at the beck and call of an employer who can ask the world of you but give you no security in return,” he said. In contrast to average zero-hours contract workers in Britain, Johnson takes home a hefty salary. For his MP role in Uxbridge and South Ruislip he earns £67,060 per annum, while he is estimated to reap £143,911 each year for his position as Mayor of London. Watching Boris Johnson making light-heart of zero-hour contracts was like watching Hitler make a joke about taking a shower Arsewipe. Johnson also earns a six-figure salary penning articles for the Telegraph, according to the Guardian. Following Johnson’s appointment, PM David Cameron said the Mayor of London would focus primarily on his mayorship, but would also drop in to cabinet meetings. Political analysts suggest Johnson will be offered a formal government post when his role as mayor comes to a close in 2016.